Our children are Judaism's most important resource; and our hopes and dreams for our Jewish future. We, at Kol Haverim, are dedicated to building a warm, comfortable and positive climate of Jewish experiences and learning for our students. Parents are the necessary ingredient to make our efforts successful. Please join us in this endeavor! Karen Trager is an experienced, versatile educator with a passion for sharing her love of learning with others. She has worked in a variety of roles in her career, mostly in Jewish education settings, including Mentor Teacher at Beth El Temple, West Hartford; Principal of Solomon Schechter Day School in West Hartford; Executive Director of the Commission on Jewish Education of the Jewish Federation of Greater Hartford, and Director of Education at Temple Emanu-El in Dallas, Texas. She connects well with people of all ages, and students, teachers, parents and lay leaders all enjoy working and learning with her. Ms. Trager holds two Master’s degrees in Education (M.S. from Bank Street College and M.A. from Hebrew Union College-Jewish Institute of Religion). She is a long-time member, and past officer, of the Association of Reform Jewish Educators (ARJE) and was awarded the RJE certification. She currently lives in South Windsor, Connecticut and has two daughters (one is Developmental English Department Chair at Tunxis Community College in Farmington, and the other is Director of Learning and Innovation at Temple Emanu-El in Dallas, Texas). She enjoys people (especially her 3 young granddaughters), music, and Jewish education, and is excited to be part of Congregation Kol Haverim’s team. Mandy Renert grew up coming to Kol Haverim and was both Bat Mitzvahed and confirmed here. She received her education at the University of Connecticut and at Eastern Connecticut State University. Mandy currently teaches 8th grade English at Sage Park Middle School in Windsor, CT and has for the past 9 years. At SPMS, she is a team leader, the Unified Sports head coach and helps to coordinate and run the after school homework program and the annual Washington, D.C. field trip. At CKH, over the past 7 years, Mandy has taught 4th grade Judaica and 8th and 9th grade Confirmation. Her strengths, both in and out of the classroom, are her creativity and organization. She is excited to be a part of this new education team and work with the parents, faculty and congregation for this upcoming school year. One of Kol Haverim's fundamental goals is the transmission of Jewish Heritage. In conjunction with an active Jewish home life, our educational programs strive to increase Jewish literacy, feeling, knowledge and observance and to foster a love for the Reform Jewish way of life. THE KOL HAVERIM RELIGIOUS SCHOOL inspires our children with a positive and abiding connection to our Jewish faith, history and traditions. The Religious School begins with the Nursery Program and continues through 12th grade with the goal of creating a literate, caring, active Jewish young adult at the time of confirmation. Jews who affirm their Jewish identity and bind themselves inseparably to our people by word and by deed. Jews who bear witness to the Brit (the covenant between God and the Jewish people) through the practice of mitzvot (commandments) as studied in the Torah and classic Jewish literature, and as interpreted in the light of historic development and contemporary liberal Jewish thought. Jews who affirm their historic bond to Eretz Yisrael, the Land of Israel. Jews who cherish and study Hebrew, the language of the Jewish people. Jews who value and practice Tefilah (prayer). Jews who further the causes of Justice, Freedom, and Peace by pursuing Tzedek (righteousness), Mishpat (justice) and Chesed (loving deeds). Jews who celebrate Shabbat, the Holy Days and the festivals and observe the Jewish ceremonies marking the significant occasions in their lives. Jews who esteem their own person and the person of others; their own family and the family of others; their own community and the community of others. Jews who express kinship with K'lal Yisrael by actively seeking the welfare of Jews throughout the world. Jews who support and participate in the life of the synagogue. Of special note is The Confirmation Academy which offers a unique program of core courses, electives, group activities and community service to our 8th - 12th grade students. Its goal is to give them the "tools" needed to create a meaningful Jewish life as adults. Each session is preceded by a "social time" of dinner and shmoozing. The program culminates with the 12th grade students' participation in the Service of Confirmation on Shavuot. The Nursery Program meets monthly, while Grades K - 2 and 7 - 12 meet once a week. Hebrew studies begin in the 2nd grade and Grades 3 - 6 meet twice a week. 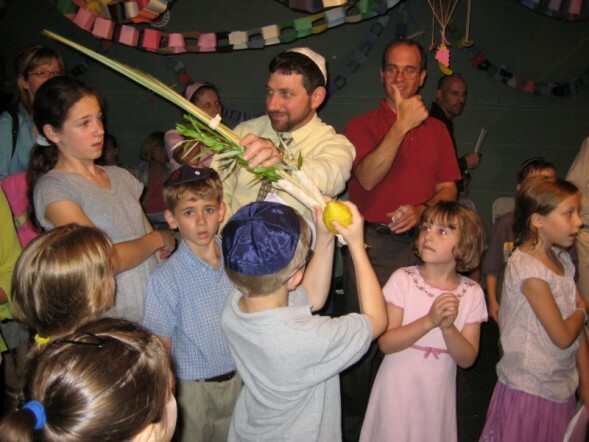 Bar/Bat Mitzvah instruction is provided in the 7th grade. Family education programs provide opportunities for families to learn and celebrate together through enjoyable experiential and participatory activities.